Predominantly black trim finish to dashboard and centre console area with bright alloy areas around radio/air conditioning panel and auxiliary switch/clock panel. Instrumentation binnacle mounted directly in front of the driver incorporating speedometer, rev counter, and bar gauges for ancillary instruments. Row of warning lights above and below in plastic surround. Two-spoke steering wheel with leather surround of same design as early Series 2 saloons. Air conditioning ventilator layout at each end of dashboard adjustable, and in central area following Series 2 XJ format. Centre console layout as Series 2 saloons but with shallower slope to mid-area leading up to armrest. Lockable glove-box on passenger side of dashboard. Bucket-type seating with horizontal pleats in the leather inserts and incorporating built in headrests. Seat adjustment to allow access to rear compartment. Rear sculptured seat area to match style of front. Door panels heat embossed with full-length armrests/door pulls and built in pockets. Door handles and lock mechanisms as XJ saloons and lower panels incorporating carpet areas and speaker grilles. Rear side windows do not open. All Pre-HE XJ-Ss were finished in leather trim, but cloth available to special order. Boot trimmed in black carpet with pre-formed plastic spare wheel cover. Pre-HE XJ-Ss featured no interior wood veneer, merely alloy and black. All cars from 1975 through to 1991 carried this style of bar gauge instrument binnacle. 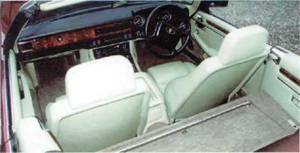 Above left: Revised interior from the Pre-HE models, initially with burr elm woodwork, replaced from 1987 by walnut Black fabric coverings to the centre console were also replaced by wood veneer in 1987. Steering wheel design changed to S3 XJ from S2 XJ style on Pre-HE models. Burr elm veneered woodwork fitted to horizontal sections of dashboard and auxiliary switch panel. From 1987 also fitted to ski-slope on centre console. Elm woodwork cappings also fitted to revised style door trims without heat embossing in trim. Black vinyl replaced previous bright alloy finish around centre console area. Veneer on later cars changed to burr walnut. 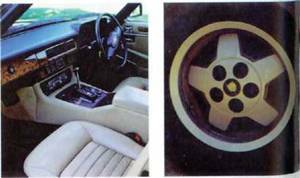 Steering wheel of later XJ type with more rectangular centre boss and thicker rim, replaced again in 1987 by one incorporating finger grips. Two horn push buttons to centre spoke. Rear seating now incorporated built-in seat belt connectors. Boot now carpeted in grey with black soft spare wheel cover. NB: After 1989 other changes took place according to model, such as the fitting of another (four-spoke) steering wheel, revised seating, etc. More interior changes affected all models with the facelift, including a new centre console, better switchgear, and revised seating. As HE and V12 except for seats having part leather/part tweed covering to centre sections on standard models, all-leather being an extra cost option. Manual gearbox models featured black leather gaiter to gear lever on centre console, replacing auto transmission quadrant, and stitched leather gear knob. As above 3.6, HE and V12 models but door trims all leather. Revised windscreen surround to accommodate catches for targa panels. Catches also located in centre strengthening bar in roof. Twin targa panels made from glass fibre and upholstered inside with black circular locks initially, later chromed handles. Rear hood section lined and manually folded back after releasing black circular lock from strengthening bar. Rear seating removed and replaced by carpeted box area with two lockable lids incorporating luggage rails and, in the footwells, map pockets. Carpeted rear section to bulkhead. Black fabric envelope provided in boot to accommodate targa panels when removed from the roof. When hood down, a matching coloured tonneau fitted by studs and Velcro covered the hood. As coupes except for enhanced leather interior. Burr walnut veneer instead of elm. New seat design with stiffer bolsters and electric adjustment operated from control pads on side of centre console. Rear compartment featured stiffened and carpeted bulkhead area and one-piece storage box with lockable lid and luggage rail. Above left: Interior of the cabriolet model, now available with manual transmission. 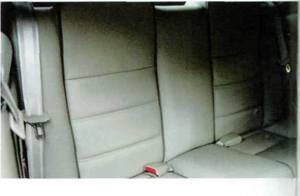 This car also features part-leather, part-cloth upholstery, available on all models from this time. Above right: Rear seating was not fitted as standard on cabriolet models. Instead this box arrangement was fitted with luggage rails. Seat design changed for the convertible, and was later fitted to other models as well. Electric seat adjustment was also available, with a generally improved trim level and walnut veneer. There were no rear seals, this new style of box arrangement being present instead, which was different to that of the cabriolet. Note also revised steering wheel. Revised dashboard layout incorporating analogue instrumentation to binnacle in front of drive with revised ignition/starter and lighting switches. Centre dash section also revised with touch sensitive switchgear, new digital clock, and/or on-board computer. New audio/air conditioning layout. Smoother switchgear to console area, squared-off trim areas to centre console. Front seating similar to previous Convertible, now all with electrical adjustment on door trims. Frameless door windows (coupe models) with no quarter-lights. Rear seating amended in style to suit front, incorporating seat belt connectors. Cloth and leather trim alternatives available on coupes. Occasional rear seating fitted from 1992 on convertible models, necessitating a new bodyshell and revised bulkhead area behind. Hood amended, with a shallower window to accommodate rear seating when hood down. By 1994 seating style altered again with ruched leather available on certain models and two-tone dashboard trim. 'Celebration' models featured half wood/leather steering wheel, available on other cars as option. 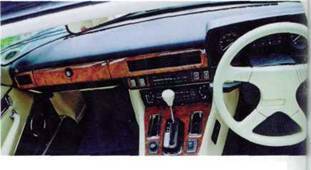 Analogue instrumentation introduced on the XJS from 1991 initially in wood veneer, later replaced by the style seen here except for V12-engined cars. 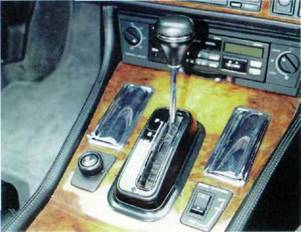 Above left: Later car interior, in this case a V12 with different seat stitching and, in this case, a half-wood/half-leather steering wheel, which was later also adopted for all Celebration models. 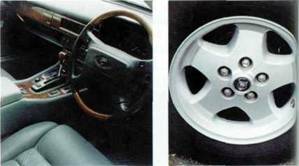 Above right: Five-spoke alloy wheels became available on XJS models from 1993. Collection Rouge: Only available to the US market. Magnolia interior piped red, with red carpets and burr elm woodwork. Classic Collection: Only available to the US market. Leather interior matching to exterior colour, pale finishes with contrast colour piping. Walnut veneer and better quality carpeting. Le Mans: Only available to European markets. Revised type seating from the convertible in Autolux leather with contrast colour piping and carpets (better quality). Embossed le Mans' name to headrests. Leather-covered steering wheel and gear knob, and door tread plates depicting car number and wins at Le Mans. Darker wood staining. Boot similarly trimmed. JaguarSport XJR-S models: Improved seating with embossed 'XJR' logos, Autolux leather, matching leather-covered steering wheel and door trims. Walnut veneer. Revised interior for JaguarSport cars included leather-covered gear knob, special steering wheel, and badging.